I used the greens and purples from their “Provençal” palette to create my “spring vines” loomwork bracelet. Here is the pattern so you can make one, too. The pattern is split into two columns. Start at the upper left of the left-hand column and work your way down. Then continue on to the rows in the second column. I show you a simple bookmark I made. It’s an odd count peyote stitch pattern, and I used Delica beads size11/0 by Miyuki. I buy the bookmark I decorated with beads . Use this pattern to stitch a band of even-count peyote stitch for a stylish cuff bracelet. 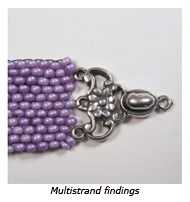 You can finish the ends by making beaded end loops and attaching them to a ready-made slide clasp. The completed band is just over one inch wide. “How do I finish a flat peyote-stitched bracelet so I can wear it?” As with most beadwork projects, there are a hundred ways to skin this potato, and those are only limited by your imagination. In her book Findings and Finishings the ever-resourceful Sharon Bateman shows several innovative ways to finish flat bracelets, including a couple wonderful stitched clasp versions and a third which involves a wireworked finding that’s surprisingly straightforward to make. Carole’s flat peyote stitch cuff bracelet patterns and finished bracelets have been purchased by bead artists like Marcia DeCoster and Diane Fitzgerald, and her collaborations with artists like Lisa Peters Art and Kristie Roeder of Artisan Clay are stunning in their simplicity and their beauty. … A friend’s 50th birthday and her love of dragonflies presented me with my first experience reading a peyote graph (a free pattern from the internet…sadly I don’t recall the designer). This one basically explains how to make the vein in a Russian Leaf. In this video, learn how to bead a sleek matching toggle for your peyote stitch bracelet, and how to attach it. This is my brain on beads.